Various delicious restaurants in Downtown Berkeley say the pasta or soba they serve is “homemade.” This distinction, though well received, made the writers at the Daily Cal wonder: What value do homemade noodles have besides their novelty? To address this question, we took to the kitchens of Ippuku, Trattoria Corso and Belli Osteria. But before heading to the kitchen, it’s important to understand what pasta and soba are. Soba is a Japanese noodle made from buckwheat flour, wheat flour and water. Italian pasta is made with wheat flour, water and eggs. For some pastas, such as tagliatelle, the water in the egg yolk is enough to bind them together. 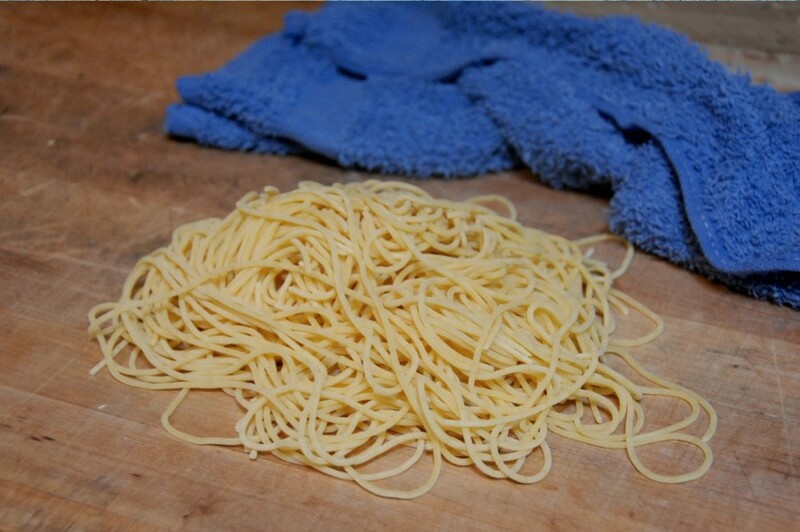 Other pastas, such as spaghetti, require only wheat flour and water. The ease of combining these basic ingredients allows the pasta to be manufactured on a large scale at a low cost. Unlike manufactured varieties, however, the noodles at these restaurants are made by hand in small batches. By doing so, the chefs can decide how the noodles pair with the other ingredients in a dish. Another desirable quality of homemade noodles is that they can be served fresh. In the case of soba, homemade noodles tend to be more nutritious than those made in factories for two reasons. First, buckwheat loses its nutritional value as it dries. Second, soba chefs can make soba with a higher proportion of buckwheat than machines can. The more buckwheat a serving of soba has, the more nutritious it is. This is because buckwheat, which helps lower blood pressure and break down alcohol, is full of water-soluble proteins and essential amino acids. In fact, buckwheat is so nutritious that it’s customary to drink the last of your dipping sauce with soba-yu, the boiling water, which is full of water-soluble proteins. While making noodles by hand allows a chef to craft traditional, preindustrial forms, it also allows that chef to customize and experiment. At Belli Osteria, the chefs are always playing with the color, the composition and the textures of pasta. There may, for example, be as many as four different kinds of flour in a single ravioli. Again, we put the question to Oprescu: Why is fresh, homemade pasta so desirable? Indeed, many chefs are going back to basics. Although noodles made by hand cost more than the manufactured alternative, for about the price of a movie ticket and a bag of popcorn, you can get a great dinner at a locally owned restaurant, where “quality” is not a dodgy term that accounts only for some ingredients instead of all of them and the food doesn’t come from a bag but is made to order. Restaurants such as Ippuku, Trattoria Corso and Belli Osteria offer fresh noodles, professional service and a stylish setting in which to enjoy them. And it’s not just about making money. It’s about being passionate, because doing so is part of what it means to be homemade in Berkeley. Contact Josh Escobar at [email protected].